The terminology itself is always an affair that needs a lot of attention and memory, because it's important to be competent while playing. Without this knowledge it's impossible to sort this mechanism out. When you see the special combinations on your reels, you can receive a bonus - the probability to proceed to another level where more money opportunities are located. In general you will have the game inside the game. A fixed arrangement of symbols that you see every time on the activated slot machine. A place where our future savings are located, so-called container for payouts. Slots drop is the amount of money that you drop into the slot machine. The slots hold is the sum of cash that the machine keeps. A program that gives you a possibility to gamble online in Slots casinos even without the need to download the appropriate software. The money won when you play slot machines, both cash or traded for competition. Loose slots provide more payoffs during one or another period of time, tight ones are working in reverse - you may have a better probability of the highest payouts. Called the machine that has the stool where you can seat. Stand Up machines mean literally as their name - you will take the verticalposition while playing. 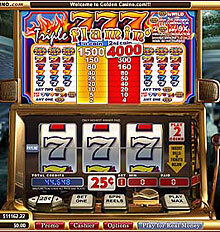 Every gambler dreams to have the multiplied symbols in the slot games, because it doubles the won sum. A line that can be both straight and curl which cuts across the symbols on the reels and thus the winning combinations are assessed. The numbers of these lines vary in the different slot types. The machines that accumulate the jackpot. Want to encounter such machine? The turning rolls on which you can see the slot symbols. They can be also animated, but in the video or online slot games. A sum of money that is paid by machine which is usually particulate and less than the cash that the player has already put to the machine. The competition between the gamblers that is measured by time. The aim is to accumulate as much as possible points or just more than your rival has. The most pleasant moment in the slot play of every gambler - the sound of payout pouring coins. Special symbol that can replace the other one during the peculiar slot game. So, is it more clearly now how to be a specialist in the slot games? You just have to master this curious slot-slang and we wish you every time to meet the Progressive Slots, to break the Coin Hopper and to listen very often to the Sound of Rain!! !